In this guide, we'll cover how to create a self-signed SSL certificate for Apache on an Ubuntu 14.04 server, which will allow you to encrypt traffic to your server. While this does not provide the benefit of third party validation of your server's identity, it fulfills the requirements of those simply wanting to transfer information securely. Let's go over exactly what this means. When you hit "ENTER", you will be asked a number of questions. The most important item that is requested is the line that reads "Common Name (e.g. server FQDN or YOUR name)". You should enter the domain name you want to associate with the certificate, or the server's public IP address if you do not have a domain name. Instead of basing our configuration file off of the 000-default.conf file in the sites-available subdirectory, we're going to base this configuration on the default-ssl.conf file that contains some default SSL configuration. This may look a bit complicated, but luckily, we don't need to worry about most of the options here. We want to set the normal things we'd configure for a virtual host (ServerAdmin, ServerName, ServerAlias, DocumentRoot, etc.) 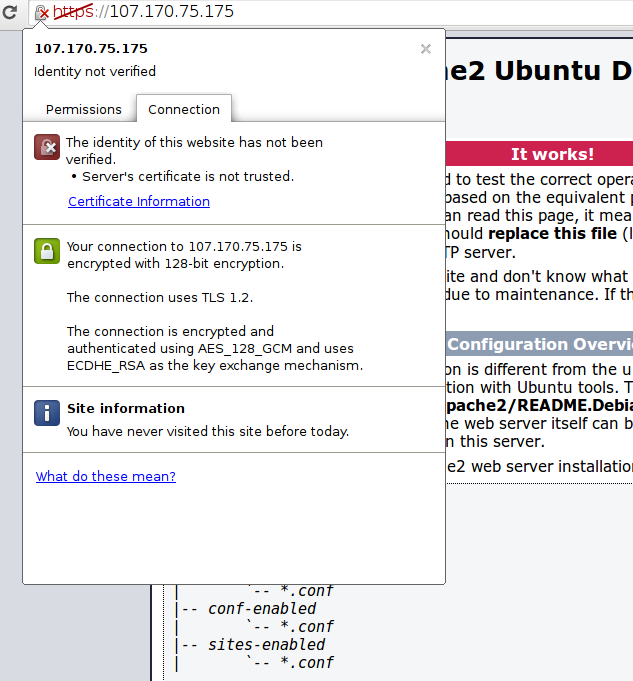 as well as change the location where Apache looks for the SSL certificate and key. Since this is expected, you can hit the "Proceed anyway" button or whatever similar option you have in your browser.